Nathalie Lete was born in 1964. She lives and works in Paris. She works in many ways, mixing different techniques and mediums, illustration, ceramics, textile and painting… She is inspired by her travels, but also by the mixing of vintage toys and old engravings of flowers and animals. 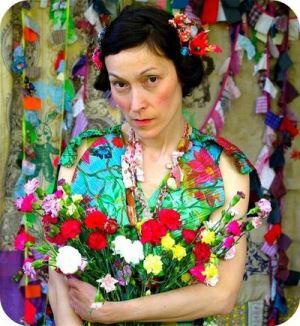 Her work is nurtured by popular and folk art from her both origins (her Chinese father her German mother). She produces children’s and graphics books, knitted and stuffed toys, glass pictures t-shirts, rugs and jewels in limited edition…both for herself and for commissions. Her work is colourful, naïve and poetic, sometimes strange, to the point of tending towards art brut.